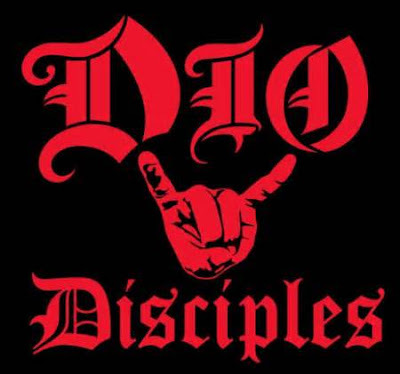 The Canadian Decibel Geeks were very excited when we received notification that the Dio Disciples would be stopping in Toronto at The Rockpile Bar and Nightclub during their current tour. I (The Meister) had seen them not too long ago in March as they rocked the MSC Poesia aboard the Monsters of Rock Cruise, but this would be the first occasion for Wally and Kate and I knew that they would not be disappointed. Faster Pussycat (many times), Helix, Kill Devil Hill, Drum Wars, Jack Russell's Great White, Stryper, Y&T, L.A. Guns, Dio Disciples, Brighton Rock and many more past and future. In October they will be opening the doors on another Rockpile (Rockpile East) on the other side of the city. Together with Black Moon Entertainment they presented tonight's show with The Dio Disciples, who took the Rockpile by storm. The festivities began around 8pm as One Divided took charge of the stage. Their music was riff heavy and high energy with the bassist in constant motion. The smoke machines billowed out their cloudy product as they tore through a rousing version of Pink Floyd's Another Brick In The Wall, which seemed to be the highlight of their six song set of original material. Amidst rumours that Stryper (playing here tomorrow night) may be in the house to catch their fellow Monsters of Rock alumni the next band, Ungrateful Children, was ready to start. The music was very heavy and I was loving it, but I visibly blanched when the vocals kicked in. By the end of the first song the singer's face was totally red and the veins popping out all over his neck from the screaming and inaudible noise that escaped his throat. During the second song Kate leaned over and showed me the memo pad on her phone containing her contribution to the review. It simply said "yikes". During a break from the screaming noise, the singer (screamer) complained about getting old as he just turned 32. "That's younger than everyone else in the bar!" came the response from the crowd.....ah, I can always count on my friends to sum it up perfectly. Avoid this band at all costs. the whole band was doing a great job with these classic cuts. Muffin closed out their set with another Priest composition in Victim of Changes and we were shocked to see how dense the throng at the front of the stage was and all the fists pumping in the air, looking more like the audience of a headlining band than an opener. Muffin were a great act, not to be fooled by the oxymoron of their name and in retrospect I wish that we had taken up residence at stage front for them. Check them out if you can. Wally and I now moved to our "usual positions" at the front of the stage. I still think that The Rockpile should put up a couple of reserved signs for us as we are always in the same spot and if you look at most of the videos taken of Rockpile shows, you can usually see our bald heads bopping along just to the left side of centre. Vegas was the next act and they had a hard time following Muffin. The singer was adorned in a Dio t-shirt as he stomped energetically around the stage delivering harmonic vocals to the heavy sound. I noticed that the crowd had thinned out down here and was no where near the draw that the previous band had achieved. Their all original set was broken up with one cover song in the form of KISS' Detroit Rock City and the singer actually did a fair Paul Stanley impression, sounding awesome. They finished out their set and while were not as exciting in my opinion as Muffin they did a decent job and I would like to catch them again sometime. Scott Warren (Angry Machines, Magica, Killing The Dragon, Master of the Moon) and Simon Wright (Lock Up The Wolves, Magica, Killing The Dragon, Master of the Moon). Oni Logan (Lynch Mob) and Tim "The Ripper" Owens (Judas Priest/Yngwie Malmsteen) share the vocal duties in place of the legend himself. This show tonight was made even more special by the absence of Simon Wright as we saw original Dio drummer Vinny Appice sitting in behind the kit. Vinny may soon start to call The Rockpile home as this is his third appearance here recently with Kill Devil Hill and Appice's Drum Wars. Fools Sailed Away from the Dream Evil record saw another duet performance. Oni remained in control of the mike for another Dream Evil cut with Sunset Superman and I was pleased to hear these more obscure selections. Oni next took us through Catch The Rainbow with Ripper joining in for harmony and them both teaming up again on Straight Through The Heart. Bassist Bjorn Englen tossed Wally a guitar pick as two Rainbow tracks followed in Long Live Rock N' Roll and Man On The Silver Mountain, the latter inspiring a sing-along chorus from the audience. Ripper, with a Monster beverage "M" tattoo on his inner wrist then took us through Black Sabbath's Heaven & Hell to complete the regular set. The encore consisted of the absolute classics Rainbow In The Dark and We Rock, both of which had the crowd singing and chanting along, fists raised high in the air or displaying the "horns" (which is widely credited as being popularised by Ronnie). I could feel the sizzling energy ripple through the crowd as we were taken on a magical ride tonight through the music of the late, great Ronnie James Dio by some of his closest friends and band mates. 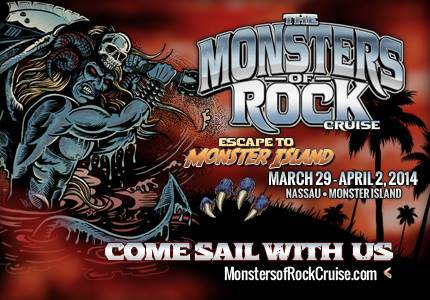 I myself have never had the pleasure of seeing Dio perform live, but this must be the next best thing and I'm soooo looking forward to seeing them again as they have been added to 2014's Monsters Of Rock Cruise. I've included two fan filmed videos from the Rockpile show that I found on you-tube below.